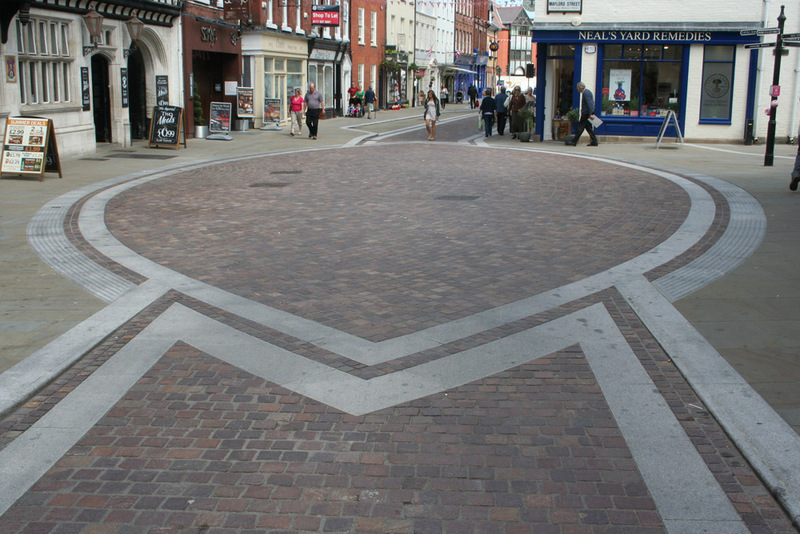 Granite curbs and porphyry setts have been used to establish a low-speed, pedestrian and bicycle-friendly environment intended to boost the attractiveness and economic prosperity of this key shopping street. Widemarsh Street in Hereford, England has been rebuilt to designs by Hamilton-Baillie Associates, working with Powell Dobson Urbanists, Anthony Jellard Associates and Amey. The project involved repaving the whole length of this prime retail street to the north of the city center. Completed on time and budget in December 2010, the street represents the standards and design principles set out in the Hereford Streetscape Strategy. The project has been shortlisted for the 2011 Local Government News awards. Widemarsh Street was both a key vehicle entrance into Herefordtown center and one of the busiest retail streets in the town center, lined with local independent traders. The layout favored vehicular traffic at the expense of pedestrians, with high curbs, few crossings and uneven footways. Herefordshire council recognized the importance of creating streets which pedestrians would be comfortable shopping and spending time in, especially given Hereford’s role as a market town and important regional retail hub. The vision for Widemarsh Street was a low speed, shared environment, free from clutter and barriers. The £1.34m project included the reconfiguration of the road layout, doubling the width available for pedestrians, and the creation of a new aesthetic for the area. The refurbished Widemarsh Street now provides a vital link between the historic city centre and proposed new retail quarter preventing the city becoming fragmented. Since its redesign Widemarsh Street has become ‘Hereford’s premier public space’ and several pubs and cafes have now applied for outdoor seating licenses, demonstrating how better design is creating opportunities for businesses to make better use of outdoor spaces. Contractor: Amey Wye Valley Ltd.